UK Uncut are planning a huge action on Sunday 9th October in London. Their plan is to block Westminster Bridge, symbolically blocking the Health & Social Care Bill from Parliament. More details in the links below. Notts Uncut have been able to arrange a free coach from Nottingham to take people to this event but we need to ensure that we fill the coach. If people want to reserve a seat, they need to e-mail nottsuncutaction@gmail.com and we will be in touch regarding departure time etc. Please spread the word. The half a million who marched and took action in London on Saturday 26th March 2011 made our feelings known and we showed our strength. 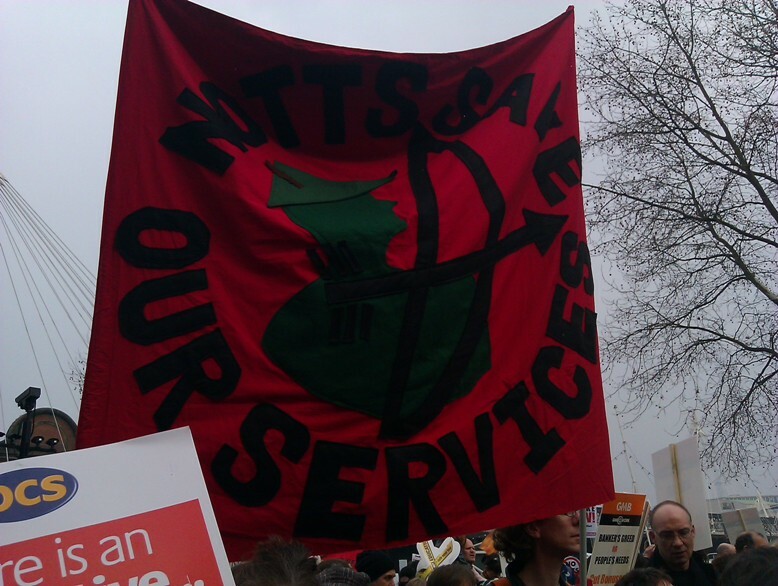 Those who are active in Notts SOS and from the many other anti-cuts groups around the country, together with all manner of service users and welfare and pension recipients, workers, students, families and children took to the streets to say no to the cuts. Is this a challenge? It begs the question of what exactly would change the government’s mind? Certainly Notts SOS will stick to its call for “No Cuts” which means we will need to carry on the work of making the politicians aware of our demand. But we have already lost a lot and there will be more to be lost in the new tax year if we do not stand up and fight. So let’s all get involved. Feel free to share your personal stories of the day, and links to your articles, blogs, photos and videos by adding a ‘comment’ to this article. 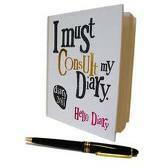 You can also do the same on the Notts SOS facebook page. On March 26th, Notts residents will join hundreds of thousands of people from across the country to protest against the government’s austerity drive. Trade unions in Nottingham and Nottinghamshire will be taking more than 30 coaches to London to join the monster March for the Alternative against the cuts. Thousands of service users, welfare recipients, workers and students will make their anger known on the streets of London. Nottingham students and lecturers from both universities and further education & six form colleges demonstrated again amongst thousands in both London and Manchester on Saturday 29th January against forthcoming rises in tuition fees, the cut to EMA that has already taken place, and cuts to other services. Some demonstrators who went to London, including some of the Nottingham contingent, ended up at the Egyptian embassy near Hyde Park in solidarity with anti-government protests there, before joining coaches back. Others took action at high street stores of tax avoiding companies, many of which were closed and had to be protected by police (reports and other media below). In Manchester hundreds of students chased NUS president through the streets with chants including “Students, workers, hear us shout, Aaron Porter sold us out” and “Porter – out”. Eventually he took refuge in Manchester Metropolitan Students’ Union, protected by a heavy cordon of riot police. NUS deputy, Vice-President Further Education Shane Chowan who took his place was drowned out by hostile chanting and pelted with eggs (full story in Manchester link below). Shocking video of UKUncut corporate tax protesters CS pepper-sprayed on Oxford Street, London [plus video of Nottingham demo]. In Nottingham on Sunday 30th January a further UKUncut demonstration was held against profiteering and the hypocrisy of governments that allow companies like Boots and Vodaphone to operate abroad and avoid tax when services are being cut – because the deficit must be reduced at all costs so we are being told time and time again. Well if the cost is forests in England being sold off, libraries being closed, the NHS being maneouvered further towards privatisation, cuts to benefits and disability allowances going ahead at breakneck speed and an increase in homelessness due to the axing of vital services, then we don’t like it one bit. We are right to be angry. Watch video of Nottingham demo. Meanwhile, on the demo in Oxford Street in London, after the Policy Exchange thinktank classed UKUncut as ‘street extremists’ who should be dealt with harshly and have their website taken down by the state for daring to suggest that something is wrong, it seems this policy idea was quickly put into practice, with protesters getting pepper sprayed in a manner that could not fail to be likened to the use of tear gas by police in Egypt in recent days. 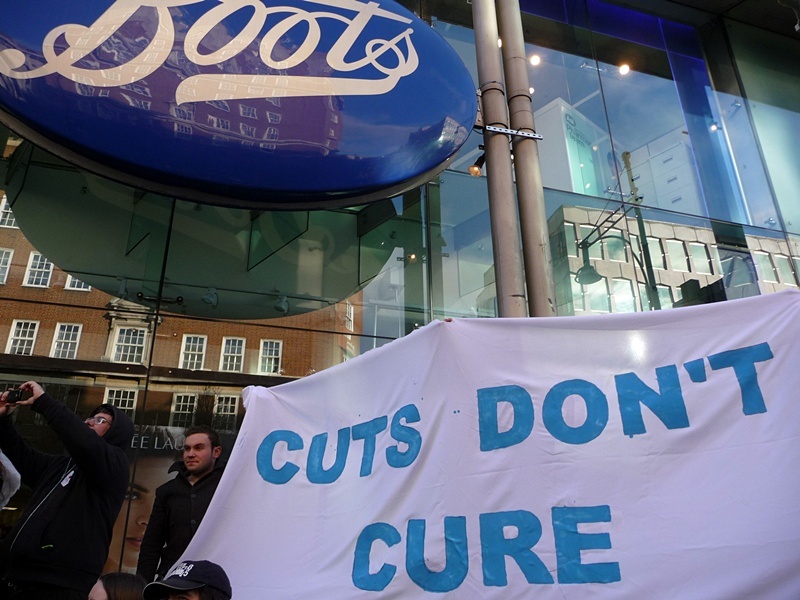 UKUncut said: Before 15:00 outside Boots on Oxford Street a female activist tried to push a leaflet through the closed door of Boots explaining the details of Boots’ tax avoidance to the staff. 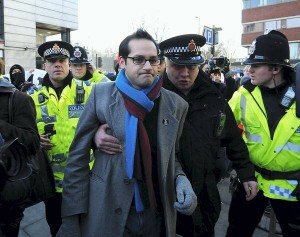 A police officer then arrested the individual for “criminal damage”. Around 20 people tried to help the female being arrested and 10 were subsequently pepper sprayed. Three people have been taken to hospital. Nottingham Students Against Fees and Cuts! 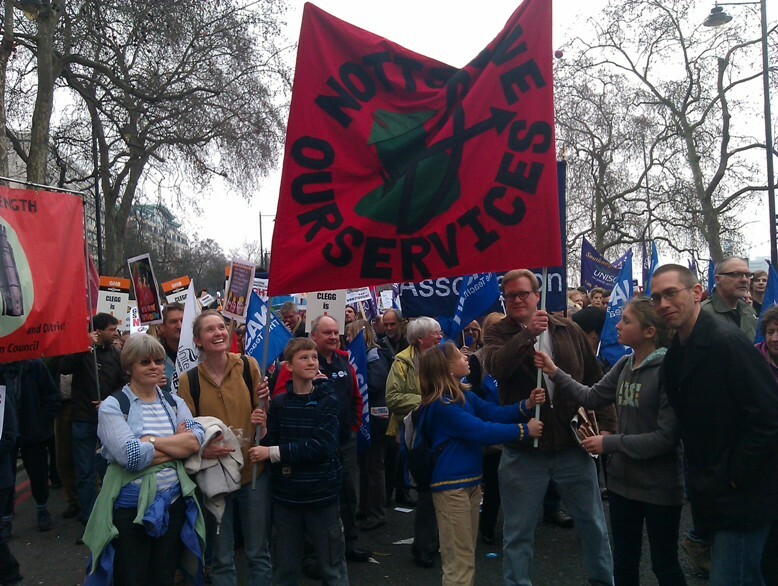 EMA Second Day of Action – Wed 19th Jan 2011 at 4.30pm [Plus coaches to 29th Jan demos]. Wednesday 19th January (Tomorrow)- Protest to Save EMA! 4.30pm Market Square, Nottingham. The Coalition government are voting on whether to scrap Educational Maintenance Allowance after the vote was postponed last week. We are holding a protest at Market Square at 4.30pm. Bring placards, banners and tell everyone you can! It’s short notice but we will still make an impact. 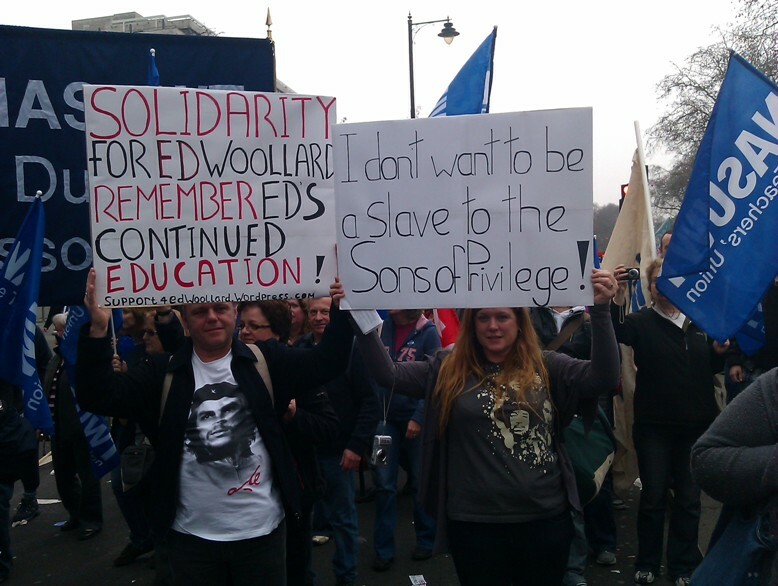 Saturday 29th January – National Demo against cuts and fees – London. 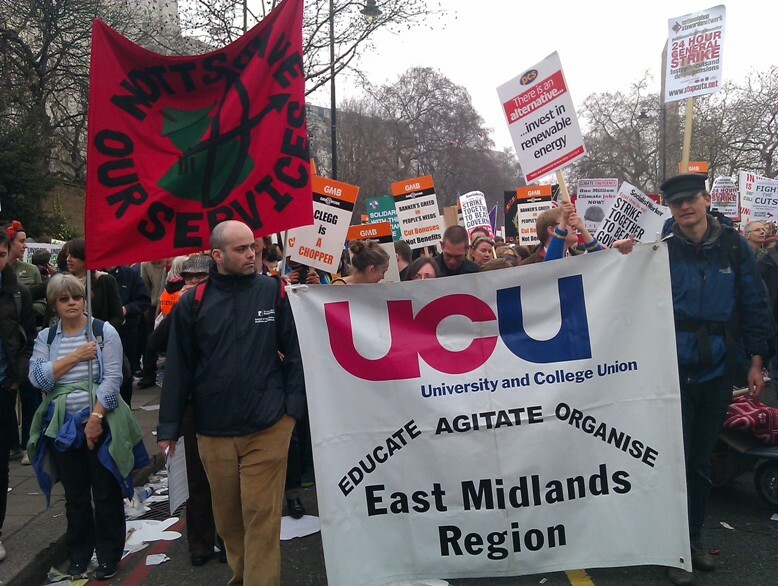 Notts SOS note: there is also a demo in Manchester on the same day which UCU is also supporting. So take your pick. meetings are held every week. For more info please get in touch via 07849 392 842.